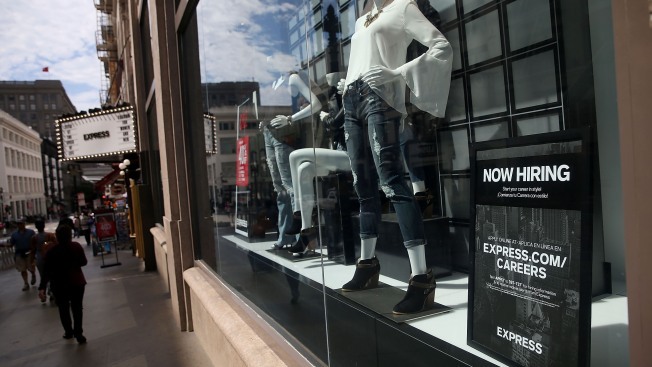 A "now hiring" sign is posted in the window of an Express clothing store on July 2, 2015 in San Francisco, California. When the government issues its October jobs report Friday morning, the data may address a key question: Has the U.S. job market downshifted into a slower pace of hiring? The report could signal a third straight month of tepid job growth after robust gains in the first half of this year averaging more than 200,000 a month. In August and September, hiring was held down as faltering global economies and a stronger dollar cut into U.S. manufacturers' overseas sales and lowered corporate profits. Evidence suggesting that China's enormous economy was weakening more than anyone had thought also likely spooked some employers. Many retailers ordered fewer goods over the summer as they worked off excess stockpiles. Those headwinds lowered job gains to just 136,000 in August and 142,000 in September. Economists have forecast that hiring in October added 185,000 jobs, according to a survey by FactSet. The unemployment rate is expected to remain 5.1 percent for a third straight month. Hiring at that level, while below last year's pace, would still be enough to lower the unemployment rate over time. Any gain above roughly 150,000 would likely also keep Federal Reserve policymakers on track to raise interest rates from record lows at their mid-December meeting, economists say. Hiring had averaged 260,000 a month last year. But that figure was likely unsustainable, many analysts say, given that the economy grew just 2 percent in the past 12 months. "At some point, we were going to shift down to a slower pace," said Richard Moody, chief economist at Regions Financial. "It was only a matter of time." Manufacturers have shed jobs for two months, and private surveys suggest that they cut jobs again in October. Oil and gas drilling firms have also been laying off workers in response to lower oil prices. Still, even slower hiring should continue to reduce the unemployment rate over time. The economy typically needs only about 100,000 jobs a month to keep the unemployment rate from rising. That figure has fallen in recent years as the aging population and increasing retirements by baby boomers have slowed the growth of the U.S. workforce. More recent data suggest that global turmoil and manufacturing's rough patch haven't hurt the entire economy. Consumers, the biggest driver of the U.S. economy, are still spending at a healthy clip, supported by lower gas prices and a recovery in the stock market. "The economy has taken some pretty big hits here, but it looks like it has survived OK," said Ethan Harris, global economist at Bank of America Merrill Lynch. The economy grew at just a 1.5 percent annual rate in the July-September quarter. The slowdown occurred mostly because businesses cut back on their stockpiles, and exports weakened. Still, Americans boosted their spending at a healthy 3.2 percent annual pace, down just a few tenths from the second quarter. Solid consumer demand has encouraged many services firms, which make up roughly 80 percent of the economy, to step up hiring. A survey by the Institute for Supply Management found that companies in the health care, retail, financial and transportation and warehousing industries all added more jobs in October than in September. Overall, services firms expanded last month at the fastest pace in three months. That's in sharp contrast to the ISM's survey of manufacturing firms, which barely grew in October. Chair Janet Yellen and other leading Fed officials have said that the economy is generally healthy and that the December meeting is a "live possibility" for a rate hike. By specifically pointing to their next meeting, "they're basically telling us something has to go wrong to stop them," Harris said. One wild card in Friday's report will be average hourly pay, which rose just 2.2 percent in September from a year earlier. That's roughly the same sluggish pace that has existed since the Great Recession ended in 2009. And it's far below the 3.5 percent that is typical in a healthy economy. Economists expect steady hiring eventually to force up pay as employers compete for a dwindling supply of available workers. But so far, there has been little sign of that happening.